Extraterrestrial Abduction Day, also known as Alien Abduction Day, is an informal holiday observed on March 20. It is mainly celebrated by people who wish to be abducted by an alien life form. There are quite many people who claim to have been abducted by extraterrestrial life forms. Such abductions are sometimes referred to as close encounters of the fourth kind. Although most scientists and mental health professionals dismiss the abduction phenomenon due to a lack of objective physical evidence, many people want to believe. The first alleged alien abduction claim to receive wide attention was the abduction of Barney and Betty Hill in 1964 and there have been hundreds of other claims since. 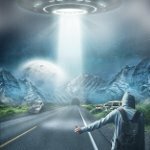 Although most supposed abductees describe their encounters with extraterrestrials as unpleasant or even terrifying, some claim that their experience was pleasurable or transformative. The latter probably are the ones who celebrate Extraterrestrial Abduction Day. The origin of Extraterrestrial Abduction Day is unknown. It is believed to have been popularized by the Alien Abduction Festival held in Toronto in 2008. There don't seem to be any official celebrations but you can create your own! For example, you can spend the day watching the skies waiting to be abducted or watch films about UFO and extraterrestrial life with your friends.